Step 2 Grease a 9 x 13 baking pan with butter and dust with flour (shake the pan a little to get an even coating of flour). Step 3 Place all the cake ingredients in a large mixing bowl. Mix with a wooden spoon or a whisk to combine. Step 4 Pour the batter into the prepared baking pan and spread evenly with a spatula. Step 5 Bake in heated oven for 25 to 30 minutes, until golden and well cooked-through. To be sure, insert a wooden skewer into the center of the cake, it should come out clean if the cake is done. Step 6 Remove from the oven and let the cake completely cool in the pan. Step 8 Stab the cake all over with a small knife or a skewer to create holes. 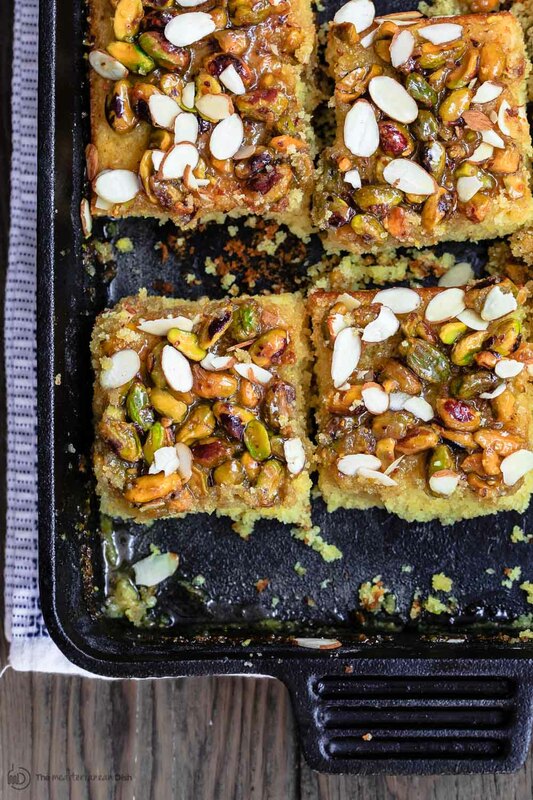 Pour the honey pistachio syrup all over the cake as evenly as possible. If you need to, use a spoon to distribute the pistachios across the top of the cake. Sprinkle shaved almonds, if using.